Awesome Air Evac, DFS and TMH Medical Services have joined forces to provide an air ambulance service based in Kabul, Afghanistan. 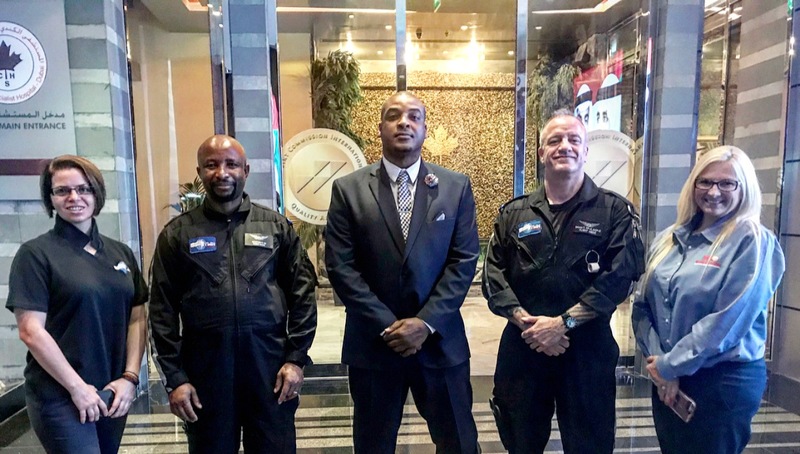 This formidable team brings years of experience in aeromedical evacuations, transport logistics, and medical support operations in hot and hostile territories to the sector. The Beech 1900D aircraft is being operated by FlyAwesome, a specialist operator in these environments, and is permanently based in Kabul to service both domestic and international requirements. The Beech 1900D has been fitted with a Med-Pac 400 Aerosled and is an ideal regional platform due to its multi-role capability, full stand up cabin and rugged dependability. The first Air Ambulance mission out of Afghanistan was successfully completed on the 13th November 2017 with the patient being moved to Dubai. Brandon Reed, Vice President Global Medevac Operations TMH Medical Services, said “I am pleased that three industry leaders have been able to come together to provide our clients with a faster, more cost effective solution to patient air transport needs. It’s taken quite a bit of planning but ultimately it’s the patients who will benefit greatest. That’s what’s most important to me. Awesome Air Evac offers fixed-wing air ambulance services covering the whole of Africa, it’s surrounding islands, Europe and the Middle-East and forms part of the international aviation group, FlyAwesome. As a global special missions company, FlyAwesome has over 30 years’ experience operating and managing numerous air support missions in both short and long term contracts for NGO’s, Aid and Relief organizations, oil companies, mining houses, freight handlers, regional airlines and Governmental institutions including operations in hot and hostile territories. The company has operated jet ambulance aircraft for over 20 years totaling in excess of 25,000 flight hours of jet air ambulance work alone. TMH Medical & Medevac is the Hostile/Remote Area Management solution and the professional team has the training, experience and resources for the treatment of minor injuries and ailments, critical and emergency care, dental procedures, physical exams, medical evacuations, first aid training, and more. The leadership of TMH has been involved in designing and operating medical clinics around the world for over 25 years. The clinics include hospital ER based, free standing urgent care, family practice, occupational medicine and Role 1 (war theatre) clinics. Customers continuously rely on TMH Medical & Medevac as their trusted source for quality care, professional service, and unmatched levels of communication and responsiveness. Diplomat Freight Services is part of the Diplomat Group, a privately owned business enterprise delivering innovative transportation solutions around the globe. DFS is practiced and proficient at providing rapid response initiatives in times of dire need. In today’s global climate of frequent change and instability, this expertise is especially crucial. With worldwide contacts and partners, DFS can establish makeshift operation centers in and around disaster afflicted areas within hours of being given the go ahead. Turnkey operations are a specialty of our group and we take great pride in our rapid response capability as it save lives. We understand urgency, and act swiftly, safely, and accordingly.